North Korea has been discussed widely, especially since Kim Jong-un took the reins after Kim Jong-il’s death. Yet, not often is it considered to be a subject of comparative strategic thought. The preoccupation with North Korean thinking, as hard as that may be to discern, and US thinking often leaves insufficient room for attention to the views of the other states that were part of the Six-Party Talks. In the case of China, official statements are closely scrutinized, but that is not the same as putting China’s policies in the context of its strategic thinking. This issue consists of five papers on how countries are seeking comparative advantage from the way the diplomacy over North Korea is handled and the way North Korea evolves. We seek to understand views in China, Japan, Russia, South Korea, and the United States with an emphasis on the latest thinking as new leaderships are facing each other in 2013. Some years ago when the Six-Party Talks were nearing their climax, I had a chance to write about strategic thinking in four of these states (excluding the United States). Evgenyi Bazhanov contributed a chapter on Russian thinking for that pursuit. After the Cheonan attack, I updated coverage with one additional chapter for the paper edition. This Special Forum allows for further updating with the benefit of a wider range of opinion and crucial timing as Northeast Asia is at a crossroads. Assertive leadership in 2013 in China, Japan, and Russia is changing the context, and the Park administration’s pursuit of trust-building with North Korea and improved ties with China should be understood in this light. Obama’s second-term foreign policy team is now in place, and its diplomacy in Northeast Asia influences the choices of others. I have asked all of the authors to consider the following four questions to give coherence to this set of articles. First, how does the country they are analyzing balance the goals of denuclearization, reunification, and regional balance of power? Second, what kind of reunification is sought and what process is seen as conducive to that objective? Third, what is their country’s ideal balance of power in Northeast Asia and how can it be furthered in negotiations over North Korea involving that country? Finally, what alternative views are found in their country, how much influence do they have, and is there any reason to expect change in the dominant current of thinking? In writing, authors have taken note of the Xi-Obama summit and Xi-Park summit of June 2013 as well as recent shifts in North Korea’s rhetoric and behavior. The parallel nature of the articles allows for comparisons, two of which are the principal concern in the remainder of this introduction. As the commemorative events for the sixtieth anniversary of the armistice to conclude the Korean War passed, talk in Washington turned to recommendations aimed at capitalizing on the strength of the US-ROK alliance to forge a wider regional security architecture. Starting with the assumption that Park Geun-hye is inclined to take the necessary constructive steps and that China is the ultimate target of overtures but is more likely to be persuaded if other states are on board, proposals turned to Abe or Putin as potential partners despite obvious reservations. Abe’s revisionism left Park taking a wait-and-see attitude, while Putin’s presumed approval of asylum for the indicted American, Edward Snowden, obliged Obama to see him as radioactive. That did not rule out, however, academic interest in how Putin might play a positive role. In late July, the International Institute of Strategic Studies (IISS) hosted a panel at its Washington office on a joint Russo-US working group report, which recommended forging a bond between Putin’s “pivot” to Asia and Obama’s “pivot.” Arguing that the interests of the two countries largely overlap in the Asia-Pacific region, the report identified the Korean Peninsula, as well as Japan and Southeast Asia, as an area where cooperation can be readily enhanced. It called on Washington to recognize Moscow’s active role on the peninsula, even to provide carrots to Pyongyang as it also looked ahead to construction of a trans-Korea railroad and pipeline. At the same time, the report called on Moscow to accept the US-ROK alliance as a positive force. These recommendations followed from two premises: that Park is reaching out eagerly to Putin, and that Putin is searching for closer ties to the ROK in pursuit of multilateralism as well as energy markets. Yet, the discussion raised doubts as to whether this was an accurate characterization of Putin’s strategic thinking, given his North Korea-centered approach to the Six-Party Talks and his reluctance to incur a backlash from China for breaking away from recent deference on this question. In the “Country Report: Russia” article of this issue there is a lengthy assessment of a July article by former ambassador to South Korea, Gleb Ivanshentsov. It is steeped in assumptions drawn from the Cold War. The following article by Alexander Lukin places such thinking within the context of debates among Russian politicians and experts. He pays particular attention to the “great-power nationalists,” whose views are not very different from Russia’s communists, emphasizing that the confrontation between the West and the emerging, rival geopolitical system, similar to the start of the Cold War, is beginning on the Korean Peninsula. While liberal views can also be found in Russia, they are marginal to the mainstream debate. Among Korean experts Lukin finds one school—in my reading, the most visible—that finds the DPRK acting rationally and justifiably in the face of US policies. An intermediate group spreads the blame to both sides, but it counts on normal ties with the DPRK gradually luring it into international cooperation. This is the soft position of the government, ruling out the use of force and insisting optimistically on a diplomatic solution. Russia puts this in the context of its strong backing from a multilateral security agreement. The Six-Party Talks are an ideal venue with pursuit of denuclearization as a means to reach consensus on an economic plan extending to the Russian Far East as well as security arrangements with the potential for a transformative effect on Russia’s place in Asia. If Moscow’s thinking about the role of Pyongyang seems to be a throwback to forty years of Cold War, Beijing’s attitudes are couched in a history of hegemonism rooted in two millennia of sinocentrism. Cheng Xiaohe emphasizes strategic thinking about the balance of power, envisioning two competing blocs on the horizon. While many around the world see the regional balance tilting in China’s direction, Chinese seem to see both the way countries have rallied around the US “rebalancing” and South Korea’s rise versus North Korea, partly compensated by Pyongyang’s development of nuclear weapons, as signs of a worsening balance of power. To resolve the tense standoff over the North’s belligerent posture, Chinese analysis insists that Seoul has to change course, enticing Pyongyang, distancing itself from Washington, and setting aside “contentious” issues. This is a formula for changing the balance in favor of the North before denuclearization—normalizing relations with all concerned parties, boosting its economy inclusive of integration with the South, and transforming the security system of Northeast Asia. Unification would be welcome to China if there was evidence that Korea would be a neutral country, supportive of a regional order that keeps the United States at a distance, marginalizes Japan, and, outsiders would add as they surveyed the evidence, contributes to sinocentrism, reviving the past. Cheng Xiaohe uses the term “de facto alliance” to describe the looming relationship between China and Russia, explaining it as a response to the US-Japan alliance. The parallel is clear in his article to the period of the Korean War and then ensuing Cold War, when alliances confronted each other over high military stakes. While China may consider the military standoff it created over the Diaoyu/Senkaku Islands as the trigger for upgrading relations with Russia in this fashion, actually over the past decade it has been the divide over how to respond to North Korea that clarified the revival of this Cold War line-up. Whereas most observers thought that the Six-Party Talks were the incubator for a regional security architecture bringing five states, if not North Korea, together in support of shared objectives, they proved to harden the split, as became evident in 2009-2010, over what that architecture should be and how denuclearization should be linked to reunification and a regional balance of power. As the articles by Lukin and Cheng suggest, the mainstream in China and Russia are largely in agreement about reviving the Six-Party Talks as a means forging a balance of power that shifts South Korea away from the United States and also Japan. While sinocentrism is not Moscow’s goal, it has been slow to recognize how multipolarity is becoming unrealistic and siding with China leaves it in a polarized regional order. North Korea is a test not only for Washington and Tokyo, but also for their alliance. In 2002-2008, ups and downs in coordination over North Korea strained the alliance. In 2009-2013, improved coordination has boosted the alliance. Not only has Pyongyang made things easier with its belligerence that has driven the allies together, but after uncertain moments when Hatoyama Yukio led Japan, strategic overlap has grown ever stronger. The 2009 nuclear posturing review showcased extended deterrence with Asia as a US priority, leading to a sustained, extended deference dialogue with Japan, whose growing support as well as interest in security is now reflected in the interim report of its national defense program guidelines in 2013. The goal is to go beyond extended deterrence to strategic stability as nuclear weapons are brought under control, but this has not occurred, not only due to North Korean intransigence but also because China has not been willing to join in a dialogue. North Korea tests Japan’s confidence in US deterrence, fear that a nuclear threat to US forces or the homeland would allow the North to blackmail Japan’s ally or that the growing military power of China could change the balance of forces in a manner that would make the United States cautious about challenging China’s position on the North. Even if intentions were not in question, Japanese could be worried about whether the US threshold for exercising deterrence would be too high. The issue is not only how to respond to a nuclear threat but also how to deal with new types of threats, such as a cyberattack, and to the gray zone of threats falling short of a hot war. 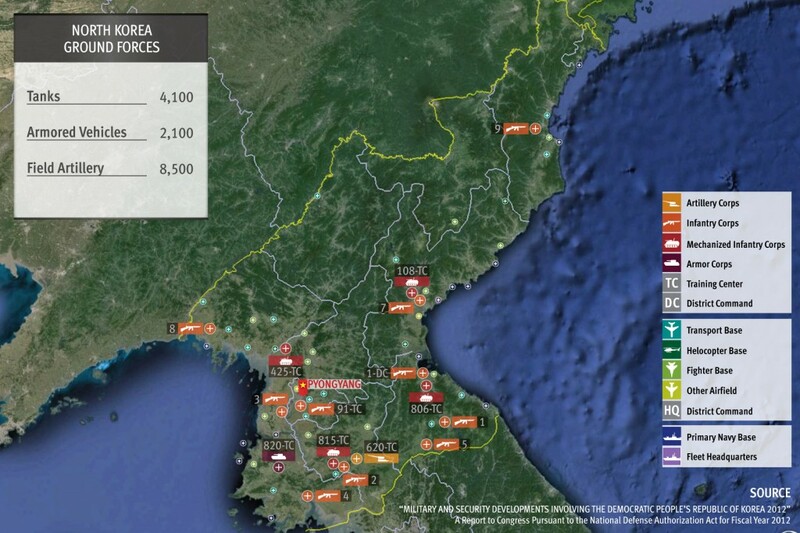 Pyongyang is a master of threats of many kinds, seeking to gain leverage. North Korea’s nuclear weapons program is testing US alliances with both South Korea and Japan. It raises questions about the credibility of US deterrence and even of its commitment, but the burden is not limited to what Washington says and does. Also in question is the capacity of each alliance to be transformed in preparation for new types of crises to demonstrate joint resolve, display new capacities, and make a show of force when necessary. For South Korea, US officials consider one important test of its adjustment to the new environment to be its acceptance of a growing role for Japan in collective defense with new weapons not only for missile defense but also with offensive capabilities. For Japan, US officials insist that it no longer make excuses for being a free rider. Its contributions must add credibility to deterrence, broadly interpreted. As discussions of problems in ROK-Japanese relations spread in 2012-2013, the security community focused on how they stand in the way of what is necessary to respond to North Korea’s increasing capacity to destabilize the region. Why have China and the United States repeatedly failed these tests? The obvious reason is that the Chinese stance has been variously construed as passive, still in transition, or intentionally deceptive. What has been interpreted as China’s goal in coordinating with the United States keeps proving to be incorrect. The goal posts are repeatedly being moved. Is China primarily concerned about US military moves to force regime change, vast refugee flows across its border, or the absence of a stage-by-stage arrangement to facilitate North Korean economic reforms? Time has shown that all of these apparent priorities were secondary, even a smokescreen for other more fundamental objectives. Reaching agreement on a course that obliges the North to change course or pay an enormous price is no longer conceivable without an agreement for managing Sino-US differences on the future of the peninsula and regional security architecture. In its absence, the path is clear for rival alliances. North Korea’s nuclear weapons program has, in stages, had a transformative effect on regional security. This was seen in 1993-1994, 2002-2003, 2009-2010, and again in the way various states in 2013 are preparing for the next set of challenges. The North’s program is not isolated from other WMD challenges. In 2012-2013 the Iranian nuclear weapons program raised parallels, particularly for US diplomacy with Russia and China, and in 2013 the Syrian use of chemical weapons tested how states responded to a country crossing a red line in WMD development, deployment, or use. During the Cold War it was generally assumed that Moscow and Washington were agreed in opposing the proliferation of WMD, while recognizing mutual assured destruction as their bilateral framework. In the post-Cold War era, even as states keep insisting on their support for denuclearization, the priority of this objective compared to others has been called into question. We have an echo of the Cold War in the rising salience of nuclear weapons in regional security without the clarity present during most of the Cold War on how to respond to activities that are indicative of proliferation. On the one hand, North Korean nuclear weapons increase the dependence of both South Korea and Japan on the United States, which provides a nuclear umbrella. On the other, North Korea’s vacillating brinksmanship and negotiations, coupled with Chinese and Russian support for the negotiations, places a greater burden on the diplomatic acumen of the United States and of its allies. One of Pyongyang’s goals is to split the allies. This is also Beijing’s goal. If Washington goes over the head of the two allies, in talks with Beijing as well as Pyongyang, then it can strain its alliances. If either alarm that the threat is becoming too serious or hopes for a quick payoff are allowed to reinforce concerns that Washington is dragging its feet, Seoul “blinks” in breaking away from a united allied stance, then all of the allies are more vulnerable. In 2009-2013, Washington had considerable success in both reassuring its two allies and coordinating to prevent divisions that would be used by Pyongyang and Beijing. What succeeded for the two alliances in 2009-2013 needs to be reexamined in the new circumstances before us: the advances in North Korea’s nuclear capabilities; the rise in China’s power; the shift in North Korea toward negotiations; the spillover from the worsening security situation in the Middle East; the sustained tensions in Japan-South Korean relations; the intensifying strategic coordination of China and Russia; and changes associated with new leadership and its divisive identity aspirations. Triangularity is proving elusive in dealing with North Korea and regional security. Politicians in Seoul, in contrast to many in the military, do not accept a realist Japan, confusing it, which is made easier by Abe’s agenda, with a revisionist Japan. This is counterproductive since there is no turning back in the rise of Japanese realism, and Washington strongly supports it and seeks Seoul’s acceptance of it. At the same time, Pyongyang cannot count on triangularity, despite Chinese and Russian support for Six-Party Talks that would not prioritize denuclearization. Russia may be deferential to China in such talks, but it is not coordinating on North Korea and has its own agenda in dealing with all of the states active in the region, which is not welcome in Beijing, even if discontent is not voiced openly. Yet, China and Russia are in agreement on one fundamental point, which is encouraging to North Korea. They refrain from criticizing the North Korean nuclear weapons program or belligerence as a major cause of the deteriorating strategic environment in the region, implying even that it is a natural response to provocations, which other states must address, in line with the North’s demands for transforming the regional security framework. The Sino-Russian-North Korean triangle may demonstrate more resilience than the US-Japanese-South Korean triangle unless strategic triangularity is given priority.